I’m slightly ashamed to say that this recipe began it’s life as a Weight-Watchers’ recipe. I have to make one thing clear before we proceed: the Weight-Watchers programme, no matter how effective, seems pretty mental to me. By putting all the emphasis on points, rather than nutrition, you could spend a day eating chocolate and still be ‘okay’ by Weight-Watchers’ standards. That, and their cynically marketed, nutritionally redundant, low point ready meals and snacks which taste of nothing but sweeteners and other chemicals, have made me a hater. There, now I’ve got that out of my system, we can move on. So. 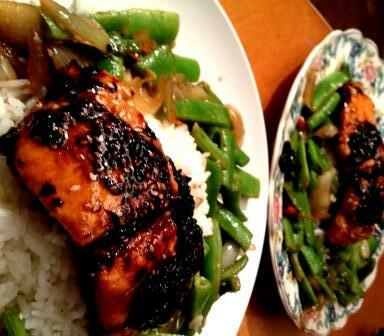 Although this meal was inspired by something my friend Laura spotted in a Weight-Watchers’ magazine, in her hands it has been transformed from bland and low-points, to delicious and screw-the-points (which is not to say that it isn’t healthy!). I have no idea how ‘authentic’ the recipe is (I’m not even sure what it would be authentic to), but I do know that it is darn tasty. It’s also responsible for convincing me to eat fish again. I went through a phase – from about 7 to, well, about 20 – when I refused to eat fish if it wasn’t tinned tuna, fish fingers or similarly bland, breaded white fish. So if you’re a fellow fish-phobe, give this recipe a go! You may be pleasantly surprised. Once combined, add the fish and coat in the marinade. It’s up to you how long you want to marinate it for, but I usually do this step first and leave it marinating while I prepare the rice and vegetables (so about 30 minutes). When you’re ready to cook the salmon, set a cast-iron griddle pan or heavy-bottomed frying pan over a high heat. Once the pan is hot, add the salmon fillets to the pan. Allow to cook for a few minutes, then spoon over a couple of spoons of marinade. Turn the fish every couple of minutes until cooked all the way through (you might have to cut one in half to check). If the pan is drying out at all, just add a bit more marinade. When the fish is ready, remove from the pan. Any sauce left in the pan should be allowed to bubble away until it becomes a thick, gloopy mess. Pour over the fish and serve. I usually serve this with boiled rice and some kind of stir-fried vegetables – like Sticky runner beans.